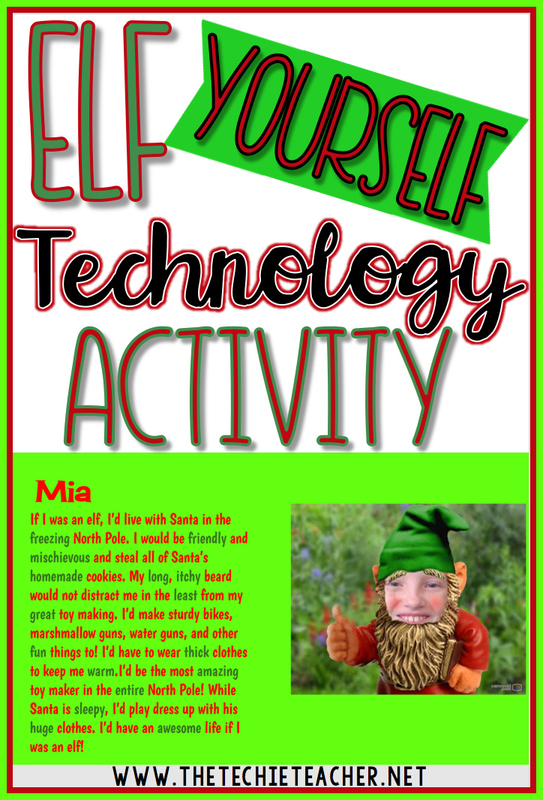 Elf Yourself Technology Activity Your Students Will Love | The Techie Teacher® . Today in 3rd grade we practiced descriptive writing in a festive way! We used the website Cameroid and chose the "Elf" scene. Students snapped their picture and downloaded it to their desktop. Next, we used a shared collaborative Google presentation in which each student was assigned a specific slide. They dragged their picture from their desktop onto their assigned slide and then started writing a short paragraph about the prompt: "If I was an elf....". The font of their paragraph defaulted to the color red. If When they used a descriptive word, they got to change that word to the color green. This was a great visual representation of descriptive writing! Our original plan was to have the kids use MoveNote to record themselves reading their paragraph; however, MoveNote was timing out on some of the students! We quickly adapted the lesson and decided to do a quick display by having one child introduce all of the slides using MoveNote. Tomorrow it will be shown on the school's morning announcements. Check it out! 2016 Update! Since this post was written, MoveNote is now a paid service.